While stock lasts! amiQure Coat & Vitality will soon no longer be available at Vetsend.co.uk. The price has been reduced, while stock lasts. 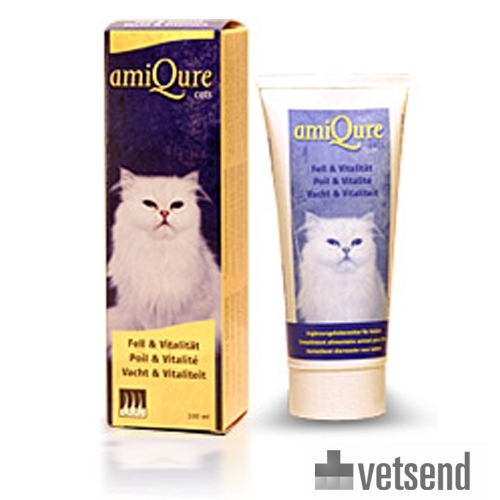 amiQure Coat & Vitality paste for cats consists of a broad spectrum of high-quality natural ingredients that restores the skin, coat and vital bodily functions or keeps it healthy in an animal-friendly way. You can apply approximately 2 cm (1.5 grams) of paste onto your cat's paw daily or mix the paste with food. The paste will become optimally effective after approximately 3 weeks. If the condition improves, the dosage can be halved. Like the other amiQure products, the Coat & Vitality formula is based on a Multi-Action system which tackles possible health problem in several ways. Have you used amiQure Coat & Vitality before? Let us know what you think about this product.